Nasty 400!! As I was searching for a new engine for my Bird, I found an old man that ran a repair shop from his barn behind his house. He mentioned he thought had two Pontiac 400 V8s in the field next to the barn. I found them; in the weeds and burried in 3 inches of sand. I chose this one, here completely filled with solidified oil sludge, to rebuild for my new Bird. 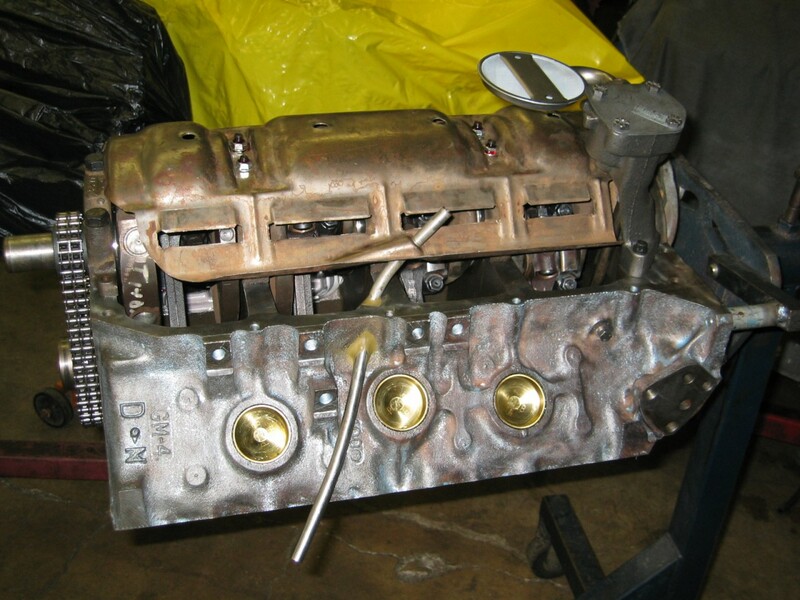 After I disassembled the engine and cleaned the block in the hot tank, I had Barney Moravits down at T&P Automotive bore the block .030 over. After cleaning the block again, it was now ready for re-assembly. The rebuild kit I purchased for the engine came with SpeedPro forged pistons. Each set of pistons and wrist pins were lightened and balanced. If you look close, you can see where I ground off all excessive metal and casting flash on the crank to help lighten the rotating mass. 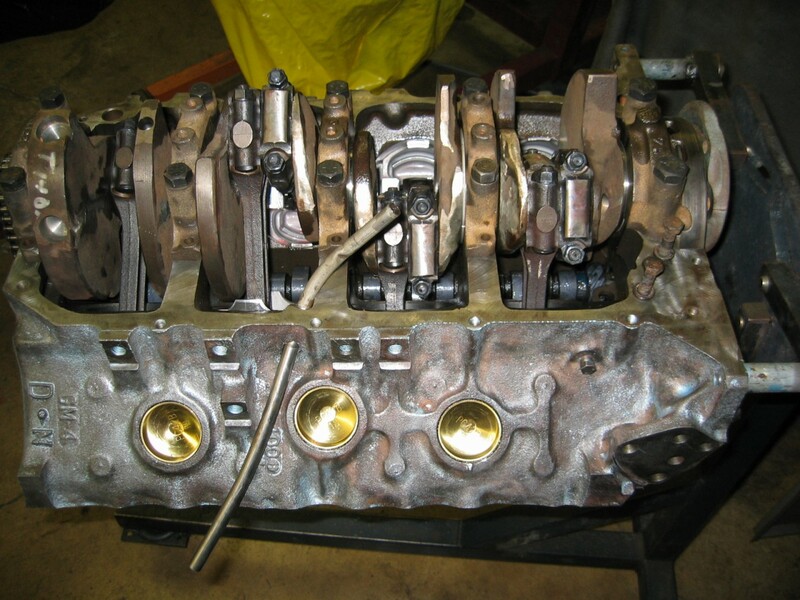 After this the crank was re-balanced and installed into the block with a brand new Viton rear main seal from B.O.P. Engineering. Finally, if you look close you can see where I took the time to lighten and balance each connecting rod. I installed the new 212/222 cam that came with my rebuild kit. It was a just little smaller than the 214/224 cam I originally wanted for my engine, but since it came with the rebuild kit I purchased, I decided to go ahead and use it. 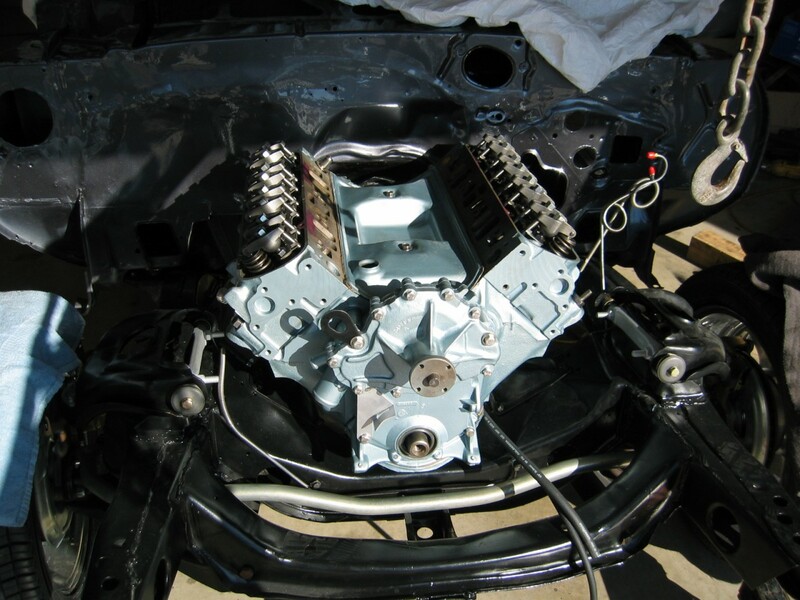 Next, I installed the new double-roller timing chain dot-to-dot at 0°. Finally, Barney put a degree wheel on the short block and verified the cam settings. 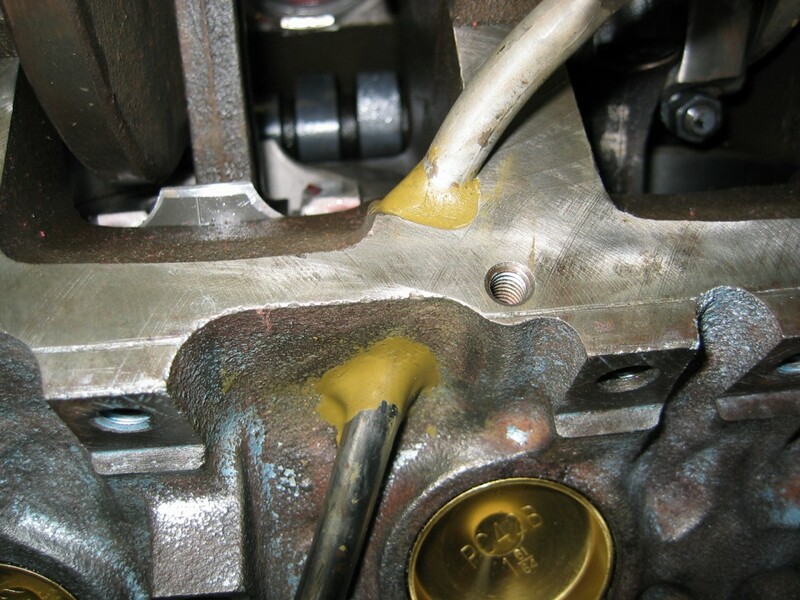 To ensure that the oil pipe that goes through the side of block and down into the oil pan does not accidently vibrate loose after time, Barney told me to use marine epoxy to hold it in place. 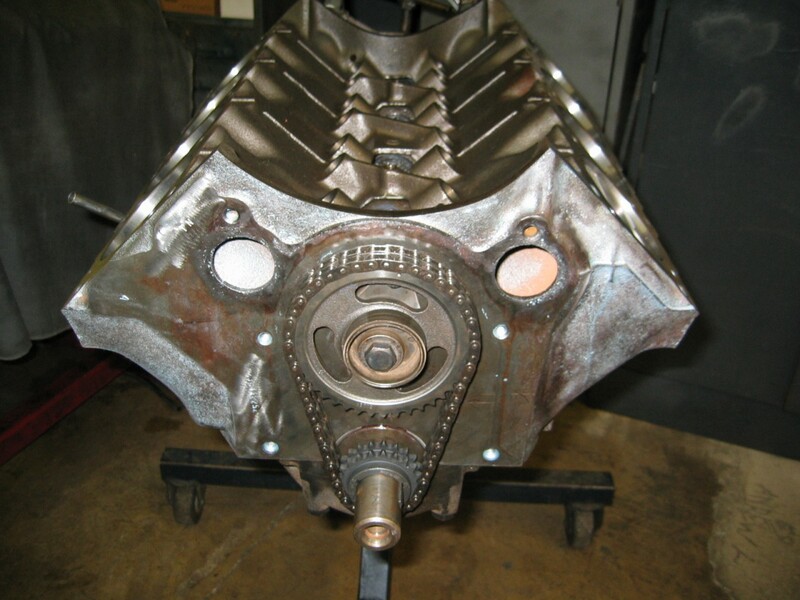 Here is the completed bottom-side of the engine. 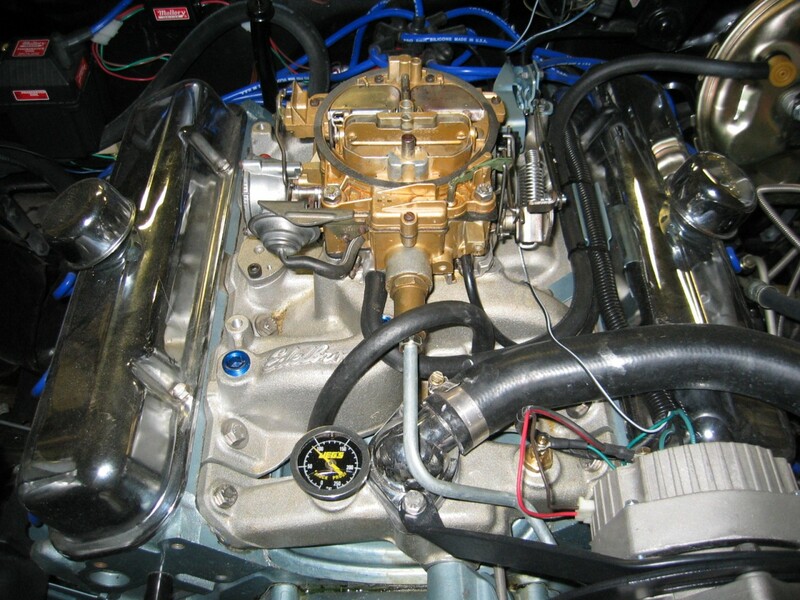 I installed a high-volume oil pump and a full-size windage tray. The oil pan that was on my new acquired engine was rusty and dented from damage incurred over the years. After cleaning it, I took it down to bare metal in a blasting cabinet. Next, I used a hammer and some wood to straighten it back to original shape. Finally, I used J.B. Weld to fill in a few places where the metal had gotten thin from rust damage. Paint. Viola!! I wanted to build an engine that would run well, but at the same time, would not require premium high-octane unleaded gasoline. 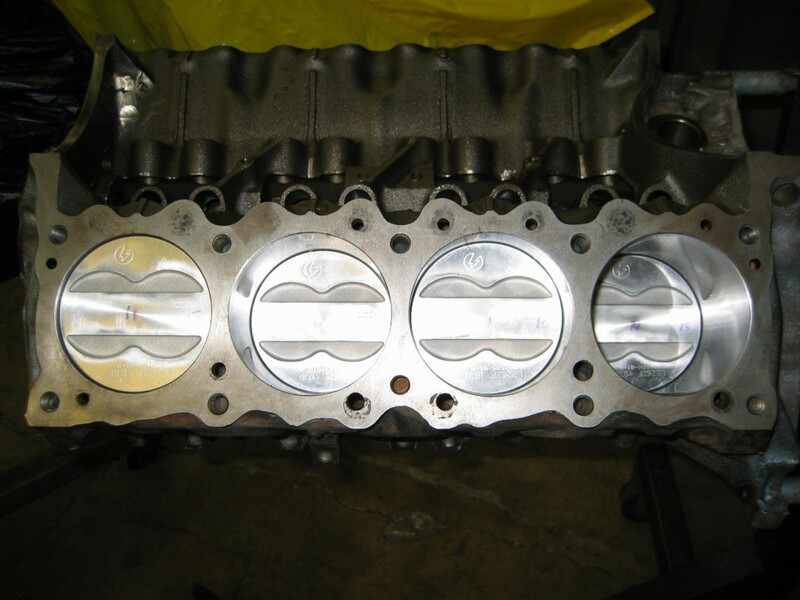 After a lot of research, I decided to go with a set of 6X-4 heads (92cc) on my 400 block. This gives me an approximate final compression ratio of 8.6:1. While I may sacrifice a bit of power, it helps save on the cost of just cruising around town. I found the 6X-4 heads at a local junkyard. I took them back to T&P Automotive where I disassembled, media blasted, and then cleaned each head. I had a professional install new brass guides and then cut the exhaust seat from 1.66 to 1.77. Then I ported and polished each chamber and runner and finally reassembled the heads. 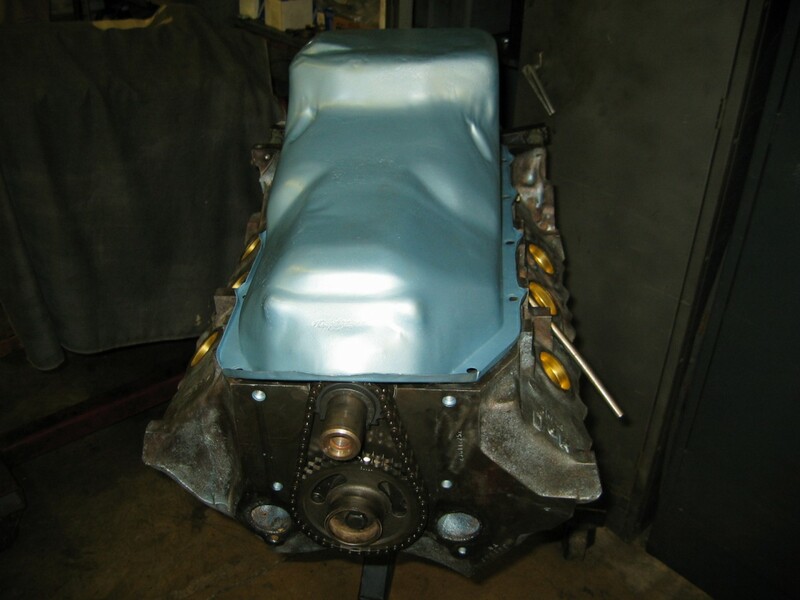 I completed most of the engine rebuild at T&P Automotive. 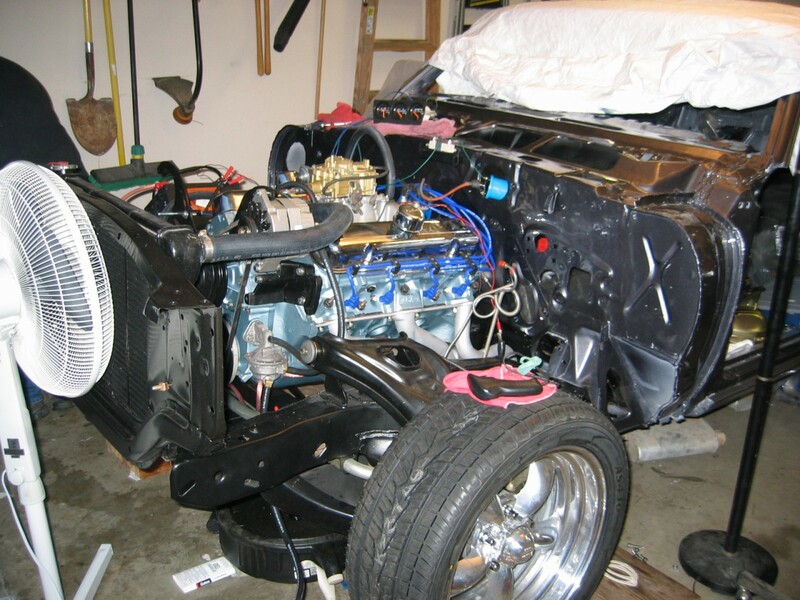 This picture was taken just before I installed the pushrods and roller-tip rockers arms. 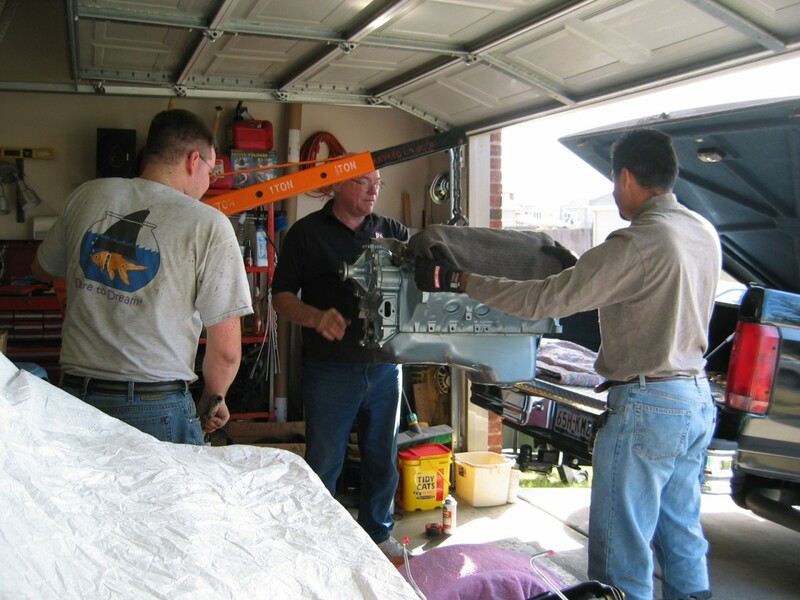 We brought the rebuilt engine home on a Saturday morning in late January 2005. I am on the left operating the hoist, and my father (behind the engine) and Alfred (POCI SCTC Chapter President) were helping guide it out of the back of the truck. 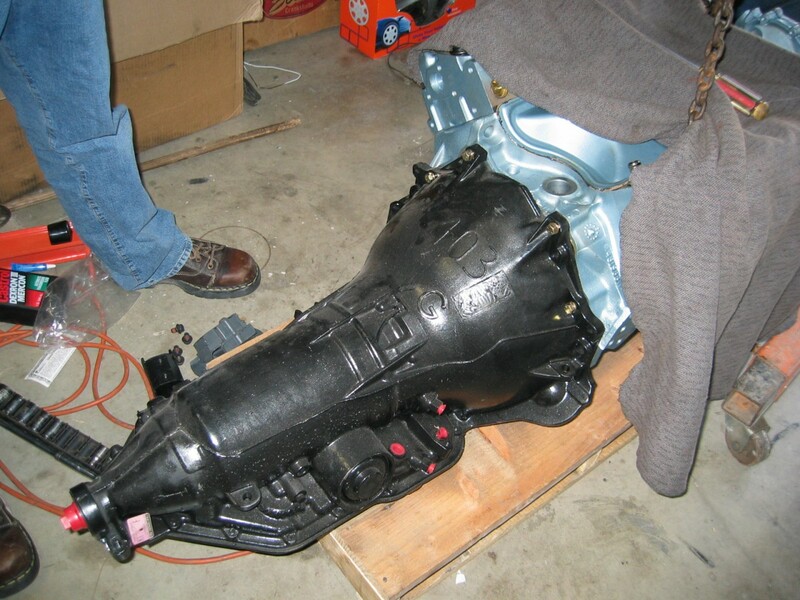 After we lifted the engine out of the truck, we lowered it onto the garage floor and mated the 200R-4 transmission to it. 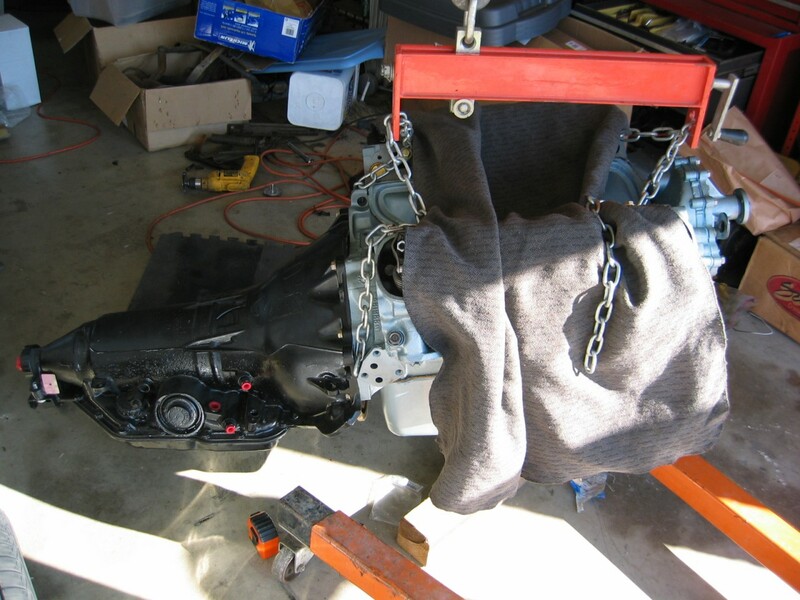 Here the completed engine and transmission assembly is ready to be lifted and placed into it's final resting place in the Firebird. Here is another picture of the engine sitting firmly on brand new engine mounts on the subframe. 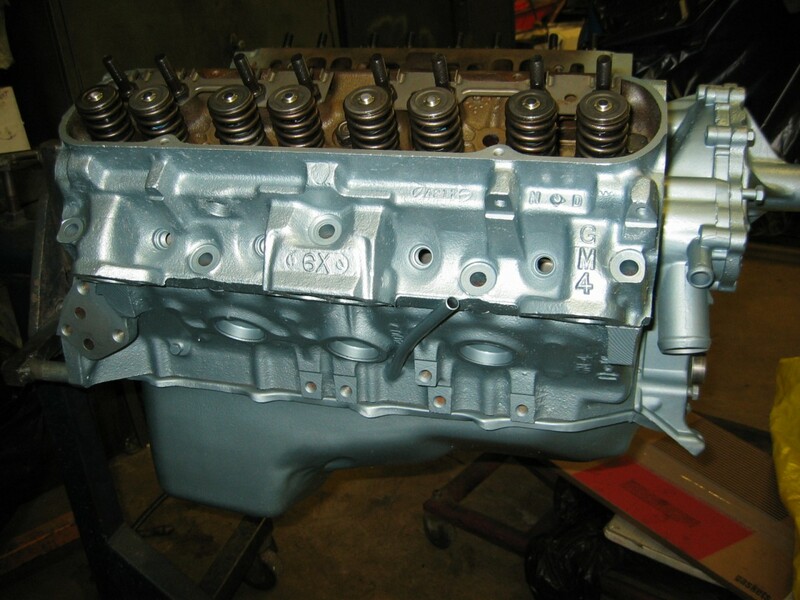 Notice the Comp Cam Magnum 1.52 Roller-Tip Rockers that were installed right before I brought the engine home from the machine shop. 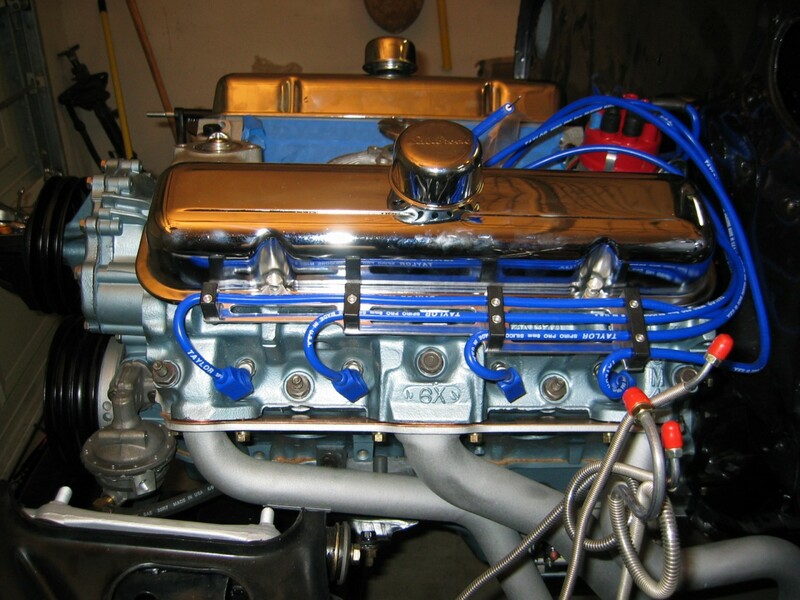 I purchased Taylor 8mm blue spark plug wires which I custom fit, cut, and crimped. I also purchased a set of billet aluminum spark plug wiring looms from Summit Racing. I really like the look of the clean spark plug wires down the side of the engine. 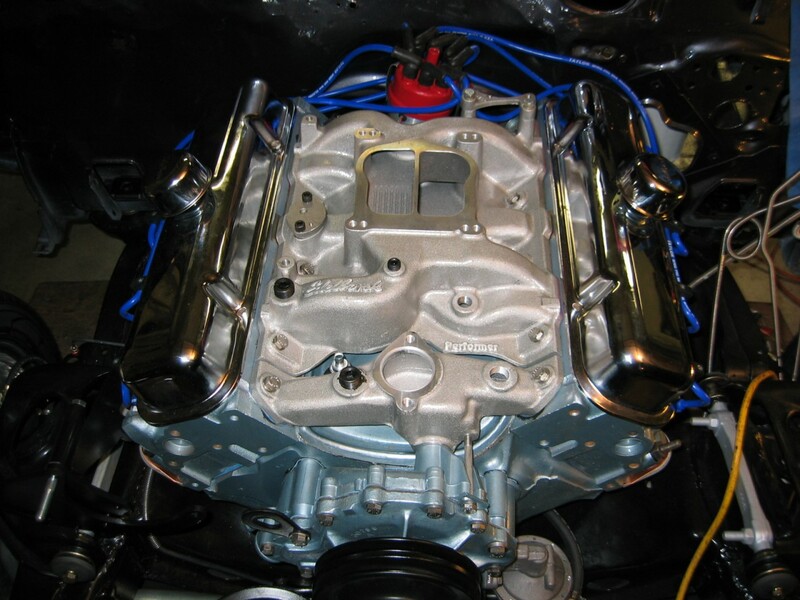 I also installed a new set of low-profile chrome valve covers and Edelbrock valve cover breathers. To help save a little weight, I installed a new Edelbrock Performer intake manifold. I preped and painted it with gloss clearcoat from Eastwood. I modified my intake manifold to help it fit better. I used a band saw and grinding wheel to cut off the water crossover on the front of the intake manifold. 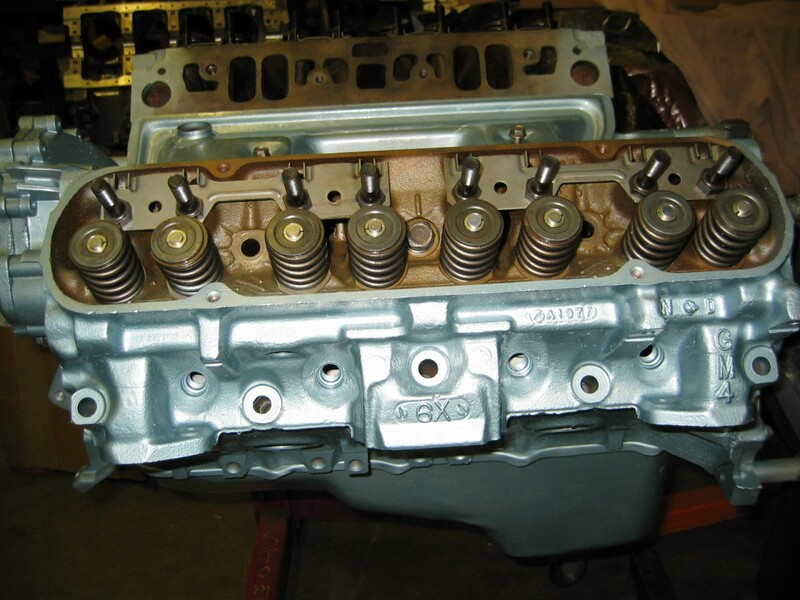 This modification allows me to keep the air and water functions of the intake manifold seperate and also allows better allignment of the intake to the heads. 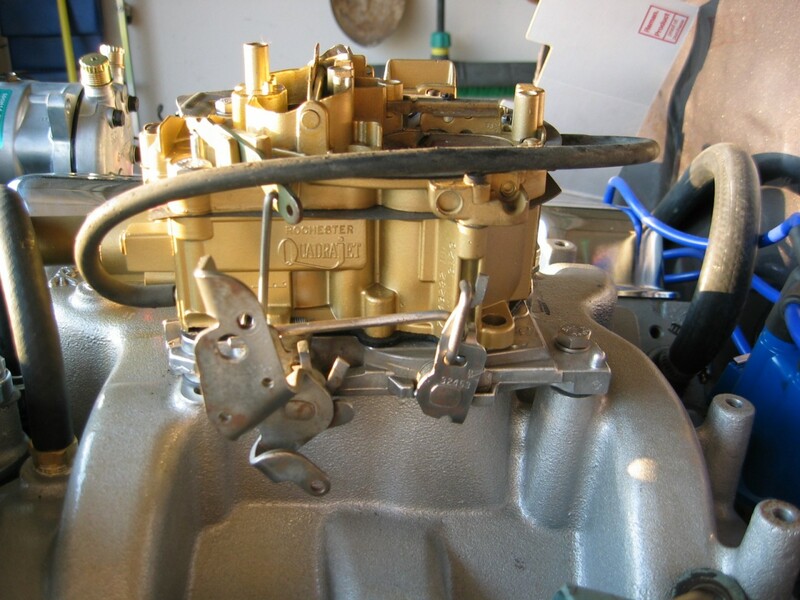 I chose to use a rebuilt Quadrajet carburetor instead of a new aftermarket unit. Because of the smaller primaries, they are more fuel efficient; but still a beast at full throttle. 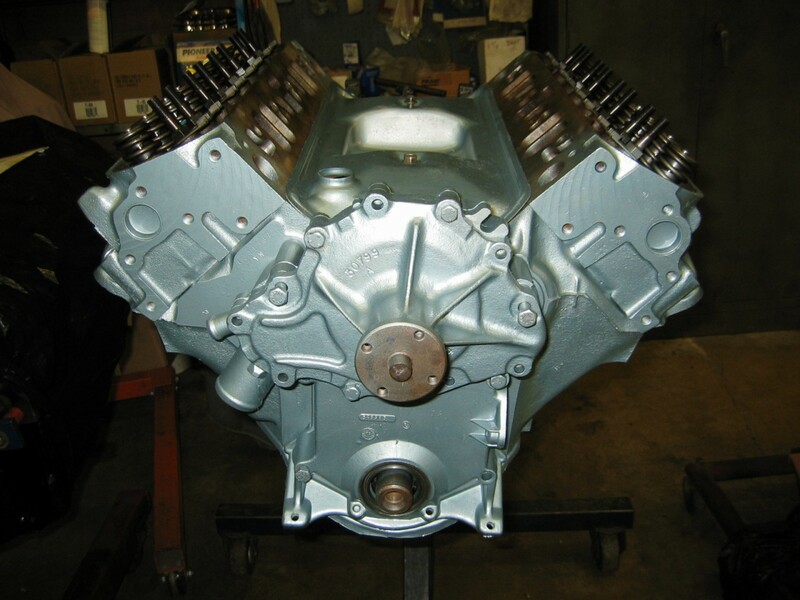 I had a friend in the Pontiac Club sell me a core and had it rebuilt by a local man that is really good with Quadrajet's. 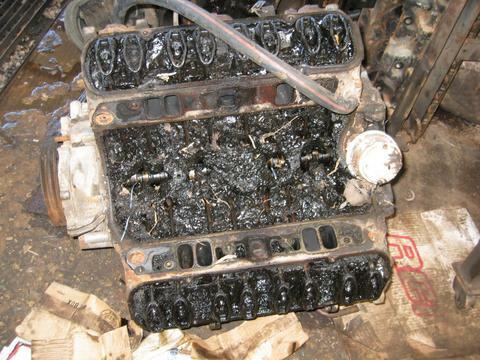 I think this carb originally came from an early 70's Olds. Works great! 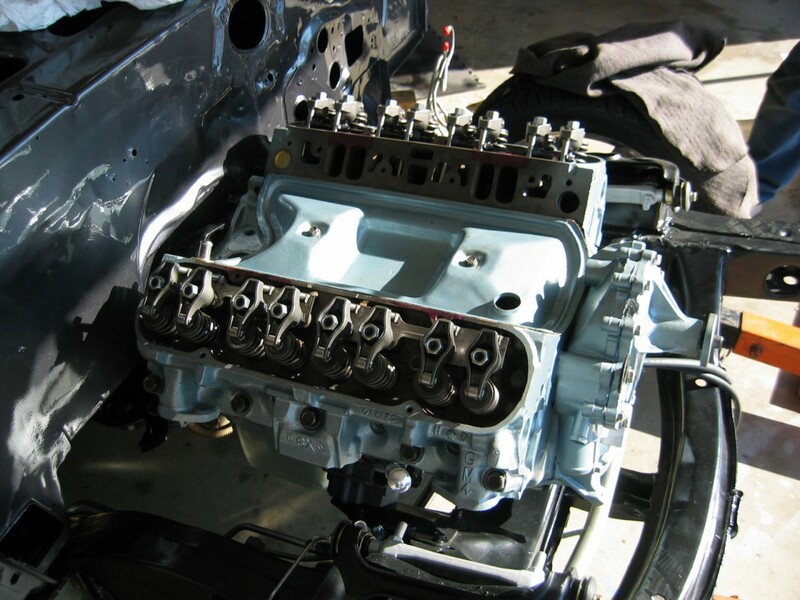 On a dreary, rainy Saturday in early February 2005, the 400ci engine came to life. A few members of the Pontiac club came over and we cobbled together some gauges off a Volvo, a used coil, a starter button, and a fan pointed directly at the radiator. Wow, it was loud with open headers!! I wanted to use a 3/8" hard line between the fuel pump and the carbutetor. After a little lesson from Alfred, I hand-bent my own hard line. I also added a water temp gauge to the front of the water crossover on the intake manifold. This gauge allows me to monitor the temperature of my engine while I am working under the hood, without having to look at a gauge inside the car. 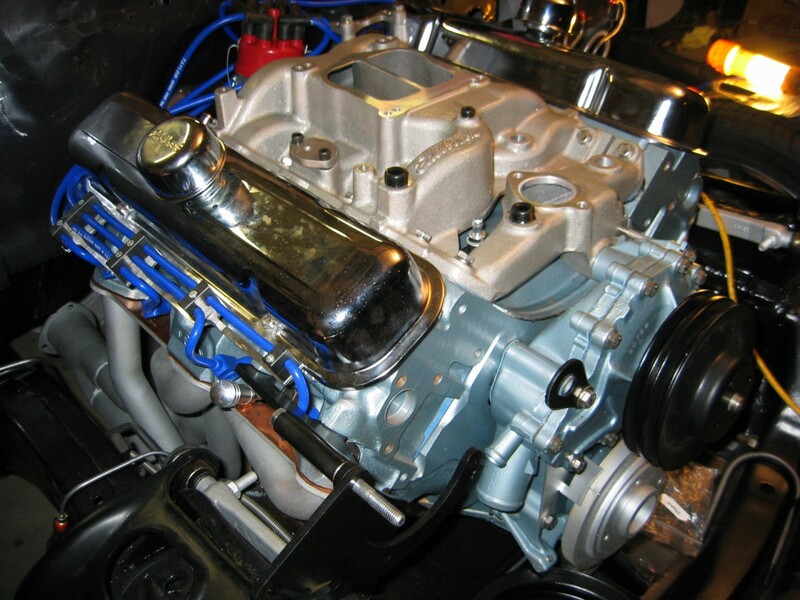 To help keep this Pontiac 400ci big block cool, I installed a Rodney Red aluminum radiator. 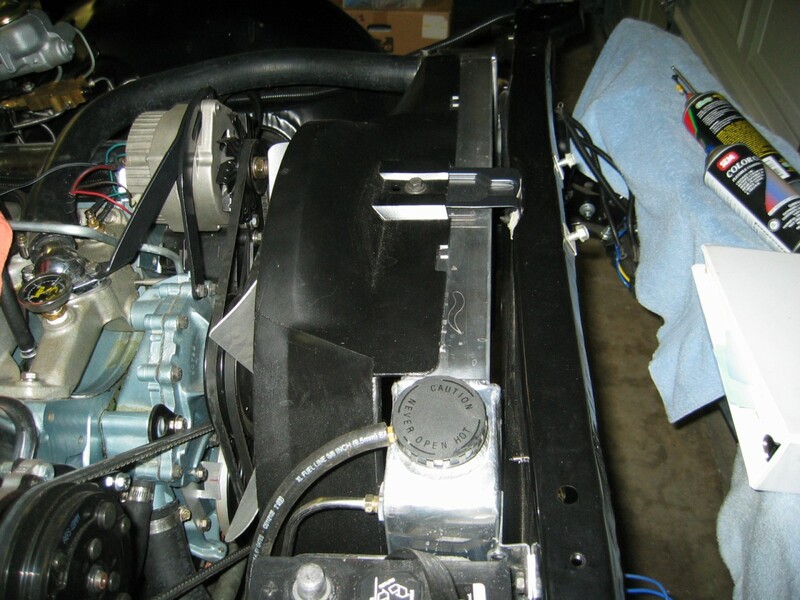 Other aluminum radiator brands I tried had claimed a "bold-in" fit for my Firebird. Total lies; every other brand required some sort of modification. But, the Rodney Red radiator was 100% bolt-in fit. 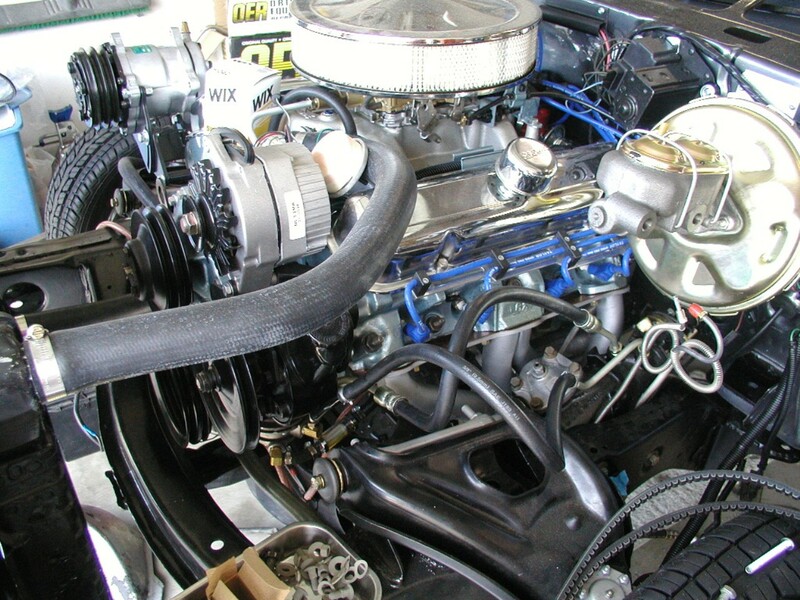 It required no modifications to the radiator support or the radiator.